It seems Baktrax was 20 years ahead of our time as our philosophy from day one has always been to travel slowly and visit fewer places so as to experience local cultures and ways of life far different from our own. Today slow and experience are two of the new buzz words in travel. But it seems there are still lots of dinosaurs around who continue to con the naive travelling public that you can see everything a country has to offer it a week or two. Baktrax knows this is not possible and never has been. All our itineraries are based on this Philosophy but the Meander tours take it up another notch or two with even less travel and even more in depth exploration of some fabulous destinations. Experience real Malaysia by staying long enough to get permanent memories rather than just passing by. Two short international flights mean even more time to meander in comfort. Malaysia is just about as good as it gets for a meander group tour. Truly Asian and as safe and friendly as anywhere on earth. The food is unrivalled also. The usual warning of danger in Malaysia applies; the buffet breakfast may not be as friendly as everything else. This group tour would be as good a choice as any for your first time in Asia. Relax and enjoy is all you need to think about. This Meander in Malaysia staying in comfortable accommodation starts and finishes with a taste of Bangkok and in between takes in K.L., Penang, Lumut and the lesser-known but no less beautiful, Pangkor Island. Once you visit Malaysia you will only want to return again and again as it is possibly the most addictive country in the world for both food and even more so for the friendly faces. ACCOMMODATION = (4 star hotel x 3 nights, 3 star hotels x 6 nights, 2 star hotels x 5 nights). BANGKOK - KUALA LUMPUR, (K.L.) - LUMUT - PANGKOR ISLAND - PENANG ISLAND. Tonight our Malaysia small group slow holiday tour package will stay in; BANGKOK - Our Malaysia small group comfortable accommodation tour officially starts when we check into our Bangkok riverside accommodation. A welcoming dinner will be had in the evening. D.
If you arrive prior your free time could be spent visiting the enormous Chatuchak weekend market and/or, Wat Phra Kaew & the Grand Palace, Wat Pho, Wat Arun. Or for a genuine local experience take a boat ride on the public transport Chao Phraya express to some local shops/markets in nearby Nonthaburi province. A few of the dozens of other options may be Vimanmek Teak Mansion, Chinatown, Wat Traimit, Jim Thompsons House, Silom or Sukhumvit road shops. Need a homesick mall? Which one? Last but not least for those with any jetlag just lay back by the pool and find time for a traditional Thai Massage. Even a month in the capital wouldn't be enough time to see it all. Tonight our Malaysia small group holiday travel tour will stay in; KUALA LUMPUR - A short international flight today will see our small group tour in the Malaysian capital of Kuala Lumpur. Better known to all as simply K.L. A bit like Bangkok is K.L. with lots to see and do. Often teeming traffic also. The Petronas Twin Towers is the must see for most. Then in no particular order it may be the colonial Kuala Lumpur Train Station, Merdeka Square, Masjid Negara (National Mosque), Masjid Jamek (Friday Mosque) or stroll around the Central Market or Lake gardens where the K.L. bird Park; www.klbirpark.com is the worlds largest walk in aviary with almost 200 species of birds. 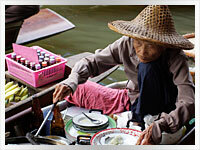 But just like Bangkok; A month wouldn't allow enough time to see all the sights let alone try all the different food. B.
Petaling Street in Chinatown has a multitude of street vendors. KUALA LUMPUR - Now that we are in our comfort zone and in relax mode you will be glad to have another full day in the capital. A day to shop, eat and see some more of the above. Well worth a visit also is the Batu Caves, a short bus ride out of town. Walk up the 272 steps to the impressive Temple Cave. The Batu Caves is where the yearly, three day Thaipusam festival is centred around. B.
Tonight our Malaysia small group travel tour package will stay in; LUMUT - Our small group tour will travel by bus today to the seaside town of Lumut. Primarily used as a transit point to Pangkor Island Lumut in itself is a great chance to see a typical Malay town minus the tourists. It really is about as laid back as you can get. As good a place as a any for a meander in real Malaysia. As usual, a great local restaurant will only be minutes away at most also. Lumut may actually be our tour highlight with its easy going atmosphere. There is also a waterfront recreation park where locals often relax with a picnic. B.
LUMUT - A free day to meander in Lumut. Will the tropical island to follow be any more relaxed? B.
Tonight our Malaysia group holiday package tour will stay on; PANGKOR ISLAND - Today we will meander down to the ferry dock for the 40-minute ferry ride that will see our small group tour on the lesser known but no less attractive island of Pangkor for three nights seaside. Apart from the beaches and scenery there are a few interesting temples such as Lin Je Kong, Foo Lin Kong or a Hindu Temple. Hire a motorbike or bicycle and do a lap of the island which is only 20 kilometres around. B.
PANGKOR ISLAND - Relax on the beach or go for a meander on this small but beautiful island. B.
PANGKOR ISLAND - Another day on a tropical island. SOMEONE HAS TO DO IT! B.
Tonight our Malaysia small group tour will stay on; PENANG ISLAND - An early start back to Lunut to catch the first of our two buses today via Ipoh which will see our group tour in Georgetown the big and busy capital of Penang island. If you thought the food was good so far then welcome to foodie paradise as we have saved the best until last. Georgetown has an atmosphere unlike any other place known to Baktrax in Malaysia and probably all of S.E. Asia. It's one of our all-time favourite destinations. Go back in time as you walk the fascinating streets of the state capital. Streets being the way to go much of the time as the footpaths are often owned by the resident house or business and as such are often blocked off for public use. 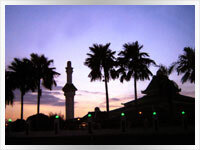 Acheen Street Mosque or Hainan Temple and dozens more mosques, temples and colonial buildings. Lastly, but not the least, maybe a budget visit to a local dentist to offset some of your holiday costs. No meals. PENANG ISLAND - Meander around Chinatown, Little India or anywhere you please today. But without doubt, the main highlight of Penang is the FOOD! 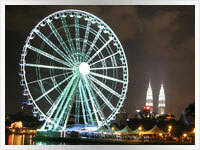 Your accommodation is within a few minutes walk of a multitude of Malay, Chinese or Indian restaurants. Penang's Curry Laksa or Indian Tandoori chicken with Garlic Nan bread washed down with a Mango Lassi are just but 3 of the well known local favs. This will also be another chance to eat the local way with a Banana Leaf Meal and it doesn't get much better than a bottomless one for a dollar or two at Krsna Villa restaurant in Little India. Indian sweets after that? B.
PENANG ISLAND - Another free day to meander or explore some more of the island at large and more FOOD! FOOD! FOOD! INSIDER FOOD TIP; Forgo at least one included hotel breakfast and invest a few dollars in a full on Indian breakfast experience. Nearby Jaya Restaurant is a great choice, (open 24 hours), or meander down to Little India for an even better local experience. Roti Chanai, Masala Dosai, Vardai or Idly all come with delicious dipping sauces washed down with a thick coffee is about as good as it gets for breakfast. Hey, we never said it was the healthiest option only the most delicious and one experience can't hurt too much, can it? Maybe some shopping at one of the modern shopping malls of Komtar, Prangin or the more upmarket Gurney Plaza. Souvenir shopping along nearby Penang Rd will see us snap up a bargain after we test our bartering skills at the many street side stalls. The most famous Ice Kaching dessert on Penang is also nearby to cool us down as we go.B. Tonight our Malaysia small group tour will stay in; BANGKOK - A short international flight will us return to Bangkok with the rest of the day at leisure. B.
BANGKOK - A final full day in Bangkok will allow time for some exploration. Last minute shopping, sightseeing or a day trip are among the myriad of options for our last day in the city of Angels known as Krungthep to the locals. Our Malaysia small group slow holiday tour package is officially over when we check out of our Bangkok accommodation. An airport transfer is included as always. B. You can now head home totally relaxed after a great vacation and you had a real travel experience with many of the wonderful Malaysian cultural delights as well. It doesn't get any better than Malaysia, whether a first-timer or an addicted repeat visitor.